A review of Bringing Conservation to Cities: Lessons from Building the Detroit River International Wildlife Refuge, by John H. Hartig. 2014. ISBN: 978-0-9921007-4-2. Michigan State University Press, East Lansing, MI. Ecovision World Monograph Series. 282 pages. John Hartig is currently the refuge manager for the Detroit River International Wildlife Refuge. He has 30 years of experience as a limnologist working in environmental science and natural resource management relating to the Great Lakes and, more particularly, to the Detroit River. Bringing Conservation to Cities is his story. He knows the history from personal involvement and he tells it well. Ten key lessons for building successful wildlife refuges, from visioning to science to recruiting families and champions. The book provides a beacon of hope, explaining how one of the most heavily polluted waterways in North America has been transformed to create an internationally significant wildlife refuge in the heart of a major metropolitan area where millions of people live—and where they can now experience nature as part of everyday life. The story delves deep: it provides countless examples of sound science being used as the foundation for ecosystem-based management of the Detroit River Refuge. It demonstrates how science and policymaking can be successfully linked given the political will, and how a radical and cohesive vision can emerge from disparate sources. 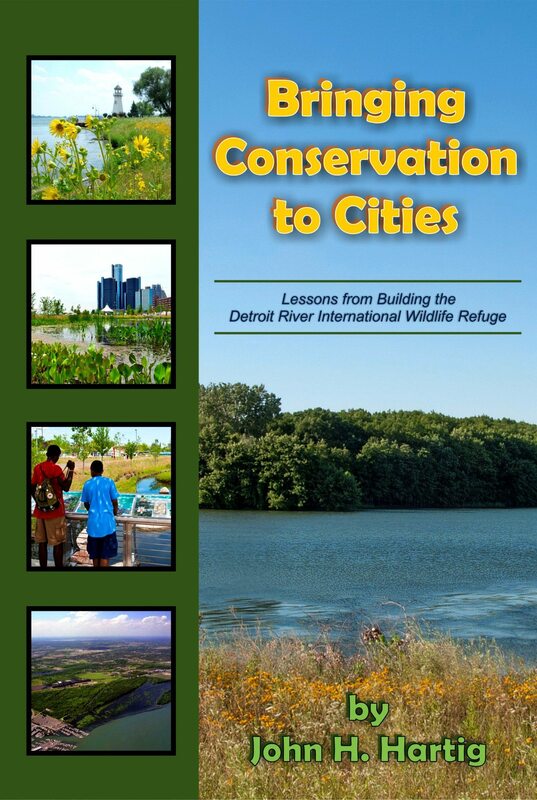 The book contains 17 tables and 36 figures providing a remarkably detailed amount of information about the history, functions and successes of the Detroit River International Wildlife Refuge. Hartig draws important lessons from all of this work to encourage conservation initiatives in cities across the world. Hartig traces the story through a series of tipping points, each of which had momentous implications for the ecology of the Detroit River. First came the fur trade, which resulted in near extinction of beavers over much of North America by the mid-1800s. Then came the massive population growth associated with development of heavy industry, including uncontrolled discharges of raw sewage into the Detroit River and, later, a cocktail of pollutants, including oil slicks and industrial chemicals that devastated the previously rich fishing grounds and the wildlife. This contamination continued unabated and, in 1948, resulted in a massive winter “duck-kill” due to oil pollution. 11,000 ducks and geese died. By the 1960s, some journalists were reporting that Lake Erie was dead. The mercury crisis of 1970, which closed all the local fisheries, was the last straw for many people and a public outcry led to the first clean water acts in 1972. The tide had started to turn. Hartig points out that important local conservation initiatives were happening throughout the post-war period, led by the growing number of wildfowlers. The 1948 incident caused them to dump piles of oil-soaked ducks and geese in front of the State Capital building and to lobby for stronger pollution control legislation. Indeed, Hartig considers that “the clean-up of the Detroit River and the establishment of the Wildlife Refuge would probably not have happened without the early and strong anti-pollution advocacy of local sportsmen.” Other hunting-related activities, including the Pointe Mouillee Waterfowl Festival, raised public awareness of the ecological significance of the area, and working-class sportsmen became strong advocates for the preservation of Pointe Mouillee for public recreation.The long-standing United Auto Workers Union, whose primary concern was wages, hours and pensions, adopted a statement in 1967 making it clear that the conservation issue was as vital to them as workers rights. This “labor environmentalism” became a major force, lobbying legislators and developing educational programs to protect the environment and to conserve natural resources. Hartig is adamant that these bodies played a critical role in influencing public opinion and legislators. They prepared the ground for future action. Here, the story moves forward 30 years, during which major changes in both public attitudes and environmental legislation occurred at every level, from global to local. By 2000, the scene was set for a major new initiative. Senior politicians, including the Canadian Deputy Prime Minister and a U.S. Congressman, brought together fifty scientists, natural resource managers, and representatives of nongovernmental organizations, from Canada and from the U.S., for a workshop to attempt to formulate a conservation vision for the Detroit River ecosystem. Amazingly, the participants reached a consensus in only two days, and the following year the International Wildlife Refuge was created. It was and still is a remarkable success story. Use sound science, practice adaptive management, and be prepared to compromise. Develop partnerships at all levels, and don’t be afraid to experiment with novel approaches. Place a priority on developing a land/ecosystem ethic through broad-based education, outreach and stewardship. Connect urban children and families with nature. Build a record of conservation success and celebrate it frequently. Quantify the economic benefits of a wildlife refuge to the local community. Involve the public in all conservation actions to establish local ownership and responsibility. Recruit and train people to become facilitators for urban change. Recruit a high profile champion. Some of these are very familiar and well established. They have been practiced with varying degrees of success for many years. Others are relatively new concepts that need to be developed further. But they are all crucial lessons that we need to take on board, and it’s good to see them dealt with in this unified way as essential ingredients for success. Hartig’s case study shows that those involved are doing precisely that. But he poses a question. He asks, “who should take the lead in such projects?” and suggests that there is a dearth of conservation leadership in most urban areas. I’m not so sure. There are many examples, in North America and elsewhere, where local strategies and projects have benefitted from strong local leadership. Indeed, strong leadership has been essential for their survival, given the pressures of urban life. But in the U.S., we have lost the national leadership on urban wildlife that was once provided very effectively by the National Institute for Urban Wildlife. Perhaps it is time to resurrect such a body. This book is crammed full of examples of strategies that work. It is a comprehensive catalogue of the politics, procedures, studies and experiments that have resulted in success. Many are very specific to the particular conditions of the Detroit River. But a lot of them are relevant to the establishment and management of wildlife refuges wherever they occur. The emphasis on good knowledge of ecology should make it required reading for environmental managers everywhere.